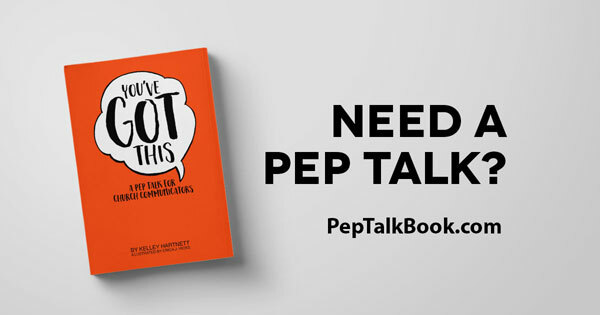 In celebration of our newest book, You’ve Got This: A Pep Talk for Church Communicators by Kelley Hartnett, we wanted to give away some free copies (score!). When I was helping to launch The Way in 2013, our strategy included a sizable bulk mailing to the neighborhoods surrounding our gathering place. I knew very little about the bulk mail system, and, long story short, I made the postcard 1/16 inch too small and the post office wouldn’t send it. Not kidding: .0625 inches was the difference between a thumbs up and a “nope.” To USPS’ credit, they genuinely felt bad for me. But there was nothing they could do, and there was no time to redo the card. I ugly-cried over that deal. Kelley learned a valuable lesson about mistakes and the value of failure. She shares the full story, in all its painful glory, right here (you won’t get this full story in the book). We all make mistakes. And we survive. Failure is how we grow. Call it semantics if you want, but Kelley’s book is a pep talk, so she’s going to call failure an opportunity. So rather than simply celebrate our book, let’s celebrate that opportunity. What mistakes have you made in your church communication career? What slip-ups saw the light of day and made you feel pretty low? How has failure made you better? Maybe it’s something small, or maybe it’s a pretty big oops (we said it would cost you). So tell us your story, and we’ll pick our favorites. We’ll choose five lucky winners who will win a print copy of You’ve Got This: A Pep Talk for Church Communicators signed by Kelley Hartnett. We’ll share some of those stories, and trust us, it’ll be OK. Note: This contest is now closed. Thanks for sharing your stories. We all make mistakes. Thanks for playing. It takes guts to share your mistakes. Oh, and check out the book that inspired it all, You’ve Got This: A Pep Talk for Church Communicators. And don’t forget to read the full story of Kelley’s mailer mishap. Physical copy winners are limited to the United States (sorry, we’re not shipping internationally). If you’re global go ahead and enter, we’ll just give you a digital copy if you win. Contest runs through Feb. 15, 2018 Feb. 22, 2018. We reserve the right to change that deadline and all the rules whenever we see fit (it’s our contest). All decisions about contest winners are final and the exact definition of “favorite” is up to us. By submitting your story, you give the Center for Church Communication all rights to change, edit, share, publish, and otherwise repurpose your story.